Ouch! We can't all put faces with names, right? I confess, I too have been reading your blog for a while and I've even gone back into the archives, because your writing makes me feel good about my knitting. This is the first time I've commented, and I just want to tell you that I'm DYING for your you-know to be published. Keep doing what you're doing, Wendy! There is absolutely nothing wrong with knitting and crocheting together, only with those who say there is! Isn't networking fun? You get to schmooze with all kinds of people, no matter who they are. I once watched over a sweet elderly lady during a demo while she waited for her daughter, and next thing I know, I'm creating models for said daughter! Love your blog and patterns! been reading your blog for years and love love love it. but what is tnna? kill me yesterday? or wait, kill me tomorrow after i find out what it is. TNNA is The National Needle Arts Association. They have meetings twice a year and all the major yarn lines, publishers, thread, embroidery and Needlepoint stuff is shown, not to mention all manner of other things that go along with the crafts. I spotted a ton of folks I recognized, though! I like the looks of your blanket too. Sometimes I think simple looks better than complicated. I spun some yarn to make a Koolhaas hat but it's going to become a Zeebee instead, simple is better. Are you referring to the Hanky Panky (aka "starter thong")? You first have to ask yourself this question -- have you ever seen her before (in person or in a photo)? If the answer is no (I probably couldn't pick her out of a line-up if you paid me), then don't feel too bad. If you're long-lost, former college roommates? You're in trouble. If it makes you feel better, I could totally pick you out of a crowd, and I have NO IDEA what Marilyn Murphy looks like. In fact, had you not said what her job was, I'm not convinced I could have come up with that, either. Yeeesh, I just re-read that and it sounds creepy on a number of levels. Disclaimer: I am not a stalker, I just enjoy your blog. Yes, referring to the Hanky Panky Low Rise. 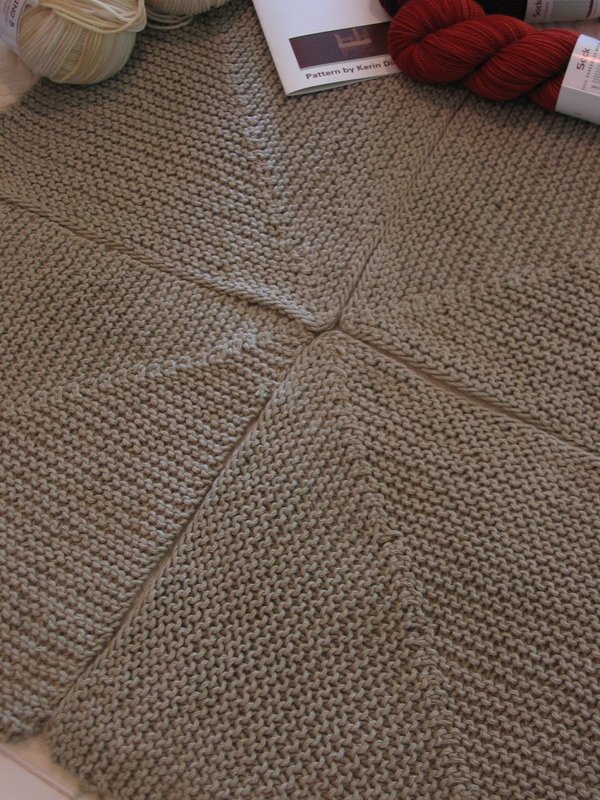 re knit with crochet border. Really all I have to do is ask myself if I want to pick up nine hundred and eleventeen stitches and knit them or if I want to crochet like a bad dog. It's like asking me if I want to cook or go out to dinner. I'll go out (crochet) every time. I added a half double crochet edging to a hat I recently designed. I've gotten nothing but positive feed back from those who have made it. Most people seem to be happy to learn a new (to them), and very simple edging. There are so many great tutorials out there these days. 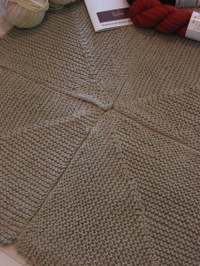 I say add your crochet edging. Those who are willing to give it a try and learn new things far outweigh the detractors. Heavens, next we'll hear on the campaign trail "And I know that in his/her youth, he/she CROCHETED!" Horrified groans all around? I say Yay Crochet! Yay Knit! Let's see more of the two together. Hee-hee. I bet Ms. Marilyn gets that a lot. I am *certain* she didn't take it personally (although she might have enjoyed a little squirming on your part). Starter thongs? For reals? Is 44 too old for that? and by 44 (to be clear), I mean MY AGE in a month, not you, b/c you are, like, YEARS younger than me. Oh, no - I can one-up you. Marilyn Murphy has seen me naked. and what kind of luck do you have to have to model on the ONE NIGHT Marilyn is staying there?? OK, I have to know what kind of underwear it was. Feel free to email me if you don't want to broadcast it to the wide Interweb. Also, I must admit, I am one of those people who don't like knitting patterns with crochet in them, for the simple reason that I cannot crochet. Not even a bit. I like the way it looks, but I am crochet-illiterate. And I have tried. I do like patterns that offer options for knitted or crocheted borders, because then I feel less stupid for not being to make the simplest crocheted border. But I am a bad test sample for knitting patterns anyway, since I also lack the ability to follow directions. Someone else whose blog I read posted about TNNA just before.. though its the first time I've heard of it, I'm entranced. I feel a summer trip coming on.. and I would like to say that I have just now officially passed from lurker, to (fellow?) blogger. Sort of because of this post.. I feel bad that you don't know who I am, and yet I read about you all the time (here, not anywhere else, don't worry). Visit if you like, I'll have pictures up soon. I for one, cannot understand the hate for mixing crochet & knit. I personally like it, but I learned to crochet first. So, I vote to go for it! It's definitely a lot faster & can be just as nice looking. It's OK Wendy, you can easily pass that sort of thing off as an "adorable eccentricity". Isn't that why everybody wears name tags? Not everybody's face is easily recognizable, so we won't kill you now. We need your inspiration and your funny blog.